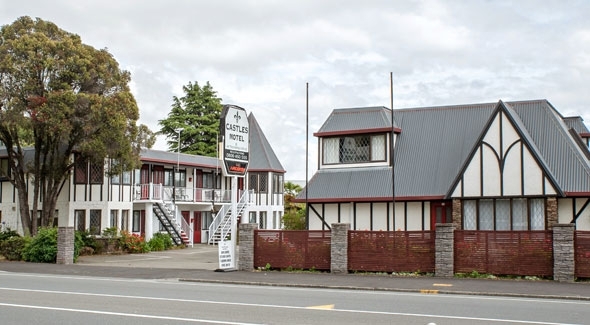 CASTLES MOTEL accommodation in sunny Nelson, New Zealand provides a range of comfortable, affordable Nelson accommodation options to suit families on holiday, corporate travellers and sporting groups. Located in the heart of Tahunanui, you can stroll past restaurants, cafes and shops on your way to the nearby park and playground at beautiful Tahunanui Beach, or take a short 5-minute drive into Nelson's CBD or to the airport. We offer a range of motel units including standard studios (sleep 3), executive studios with super king-size beds (sleep 2), 1-bedroom family/group units (sleep 4) or our special 1-bedroom spa units with 2-person spa bath in the bedroom (sleep 3). Also available to guests, by arrangement, is our meeting room with seating for 15 people. All our motel units are spacious and sunny with full kitchen/cooking facilities and are serviced daily during your stay. All units have 32” flatscreen LED TVs with HDMI and USB inputs for your laptop, camera or phone. Under our on-going refurbishment programme all bedrooms now have new (2014/15) DOUBLE GLAZED windows and upgraded kitchens and bathrooms (2016). Free WiFi through the new ultra-fast fibre network. Guest laundry on site. Continental breakfast available. All our motel units are designated non-smoking. Our rates start from $110 for 2 persons (seasonal rates apply) but please contact us directly for information on special promotions, group/corporate bookings or current discounts.